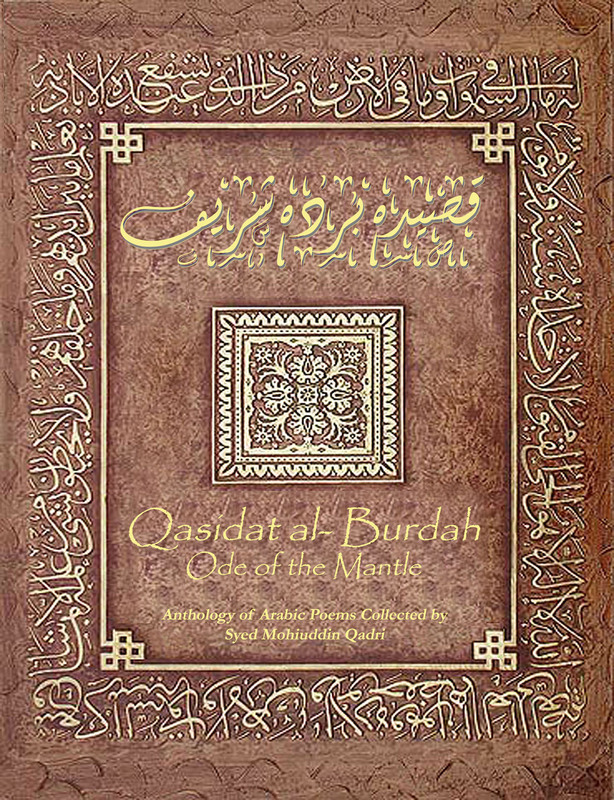 The Qasida al-Burdah is in 10 parts and has 165 verses all of which end in the Arabic letter Meem, hence it is a “Meemiyya”. Beginning with an exquisite allusion to the subject matter (بواعد الاثتهلان) in accordance with the almost established custom of introducing poems with Love Description ( النسهب), the poem gives a short description of the woeful plight of a tender lover during his separation from his sweetheart (1-8). This kind of introduction being incongruous to the sublime and grave subject of the poem, the poet, in trying to avoid this uncongruity, artfully gives it a better turn by calling in the agency of the reproachers, who come to discover his secret love, betrayed by his tears and pale colour (9-12). Naturally availing himself of the opportunity to expostulate with the lover, he exhorts him to give upsuch light pursuits as being inconsistent with his old age (13- 16). While pointing out what the old age requires him to do instead, while showing the manner in which it peremptorily bids him refrain from the indulgence of lust and passions (17-25), and while proposing to himself to (براعه التخلص) make the best amends for the time he wasted therein (26-28), he slyly glides into his subject (29), viz. ; the panegyrics of the Prophet (God’s Grace be with him). He then sings of the few out of many miracles showed by him in support of the truth of his mission (73-94), the greatest of them being the glorious and the inimitable Quran (95-108) and the Ascension of the Prophet to the heavens (109-I 15), ending with his being invested by God with honours and ranks too high for any other prophet to attain (116-119). At this stage the poet, reflecting on his past life and regretting the waste of his energies in serving and eulogising wordly people, which would rather compromise his interest in the good of the next world, makes amends by devoutly offering the poem to the Prophet (144-149), and tenders his apology, feeling confident in the generosity of the Prophet and the promises held forth by him to his people, which leave him no reason for despair even in -153( )براعه المطلب( spite of the enormity of his sins (150-152). Then gently hinting at the object he asks for 154), and not coveting the gain of any wordly good (155), he invokes the promised intercession of the Prophet on his behalf on the Day of Judgement for the pardon of his sins and crimes, and thus consoles his despairing sinful conscience (156-160). After a short prayer for himself (161-162) he finishes the poem (براعه الختام) very elegantly and appropriately, with invoking the eternal blessings of God on the head of the Prophet, his followers and his posterity, in well-rounded lines (163-165).